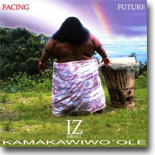 Facing the Future is the album that made Israel Kamakawiwo`ole a superstar and legend among Hawaiians and Hawaiians at heart. It is the first album to present a mix of styles of music to both entertain and intrigue the listener - from the sadness of changes in Hawaii 78 to "take me home to Makaha" the album continually changes pace and genre. The lyrical love song "White Sandy Beach" is one IZ returns to after singing it with Makaha Sons of Niihau on Ho'oluana (CD #14) but this album reaches the song's heights and potential. Used in the new movie with Brad Pitt, Meet Joe Black, Finding Forrester and in the popular E Toys commercial, the dreamy "Somewhere over the Rainbow/What a Wonderful World" tells more about IZ's hopeful vision for humanity than his later "MY WAY" type song "N DIS LIFE" in the album by that name. (CD #29). "Maui Sup'pa Man" is most requested by children, and is the myth story for this album....as IZ reveals his formula (or Jack De Mello's?) - always vary the pace: teach, tease, joke and inspire, and tug the heartstrings with pride, passion, sadness, and joy. It is all here - the best album I think, that IZ produced."